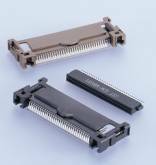 1.0mm (.039") pitch 68-circuit dual-row connector for small PC card, conforming to PCMCIA/JEIDA standard. Socket is of straddle-type, designed to accommodate PC board between the two solder tail rows. Header is with stand-off 0mm, available in both normal and reverse types. 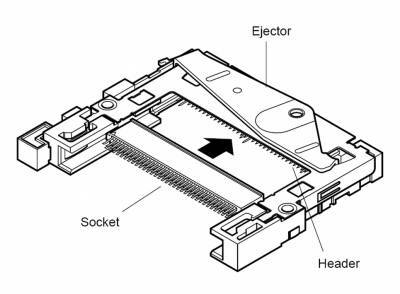 Ejector is, with the left button, to be assembled (with screws) after header is mounted. The frame has the contact point for the grounding clip on the small PC card.